The Baam race, their home planet destroyed, have settled around Jupiter and have asked Earth for permission to migrate. In the negotitaions, a key delegate of the Baam is assassinated by a corrupted Baam lord and the blame is placed upon Earth. Through this plot, the Baam people and the people of Earth engage in war. Japanese astronaut Kazuya Ryuzaki returns to Earth with a special metal...this metal is used on the super robot, Daimos. Daimos forms Earth's first line of defense against the Baam's robot machines as Kazuya learns that his martial arts skills are replicated through Daimos by way of an ingenious control system. However, the suffering of the Baam people is also brought to light when Kazuya meets and falls in love with Erika, a Baam princess working for peace between the two warring peoples. Daimos is from the Japanese anime General Daimos. Diamos is one of the first transforming robots and could transform from a truck into a giant robot. 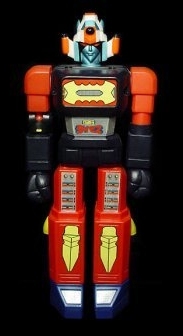 To my knowledge General Daimos was never shown in the US but was very popular in the Phillipines and Puerto Rico. Daimos is one of the harder Shoguns to find, as it came out when the product line was about to stop in the US. Most packaging for Daimos is in a french/english box, as are the directions. Daimos is probably one of the least interesting of the Shoguns made, his fist shot off and 4 soft yellow rockets fired from shooters on his legs (one on each leg). He has wide rollers on the bottoms of his feet (instead of wheel trucks) which are often missing and his missiles aren't interchangeable with any other Shogun Warrior which makes them rare (and consequently valuable). The 5 1/2" "2-in-1" die-cast version (basically the ST Japanese toy) shoots both fists and is much more desirable while the Daimos Truck vehicle fires missiles and two small cars (tough to find!). CONTENTS: DAIMOS™ warrior almost 2 feet tall! With flying missile fist, four launch-able leg rockets, bendable elbow, plus accessories. Arm is detachable. Comes FULLY ASSEMBLED. Fist missile and rockets not for use with all SHOGUN© Warriors. ©Y. & K. Toel Distributed by Mattel, Inc. Hawthorne, CA 90520. MADE IN JAPAN. Manufactured by Bandai Co. Ltd.